Inside: Clear kitchen counters might seem impossible – I sure thought so. 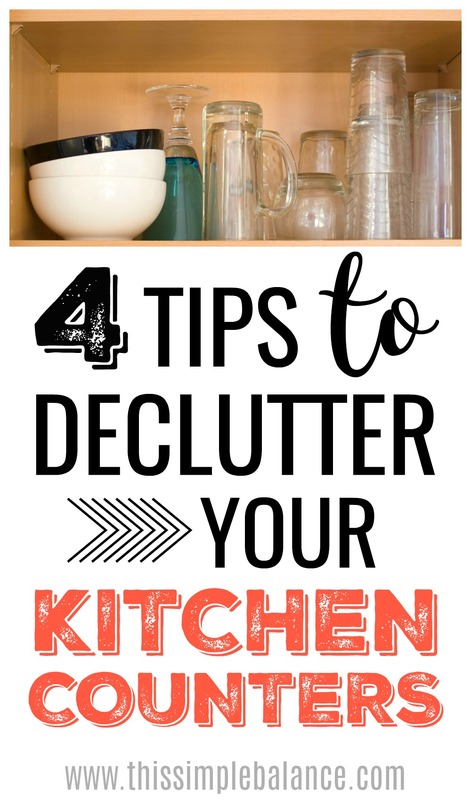 But then I discovered, yes, you can declutter kitchen countertops! Once you do, you won’t ever want to go back. 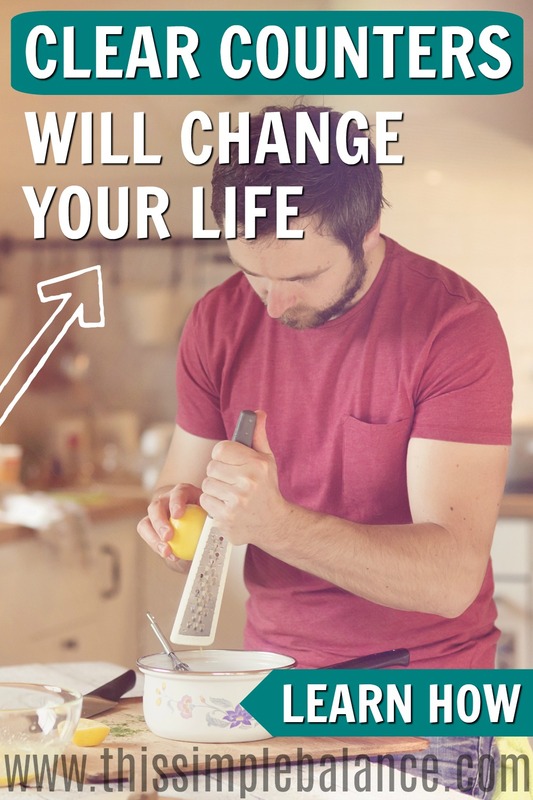 Learn 4 ways they will change your life and tips to put in into action yourself. I looked skeptically at the kitchen countertops in the pictures (a favorite minimalist blogger shared photos of her home). Even as a minimalist, I just couldn’t ever picture my kitchen counters looking that way, being that clear. We rent our small, single-family home. And the kitchen? It’s pretty much the worst kitchen we’ve ever had, and we have lived in some pretty awful city apartments. The cabinets are literally one huge connected piece of wood with doors – long shelves with dead space between the dividers. The counters aren’t horrible, but they stain easily and are poorly mounted. And of course, the actual amount of counter space is the biggest problem. I tried to make the best of it, but the lack of clear kitchen counter space started to drive me crazy! 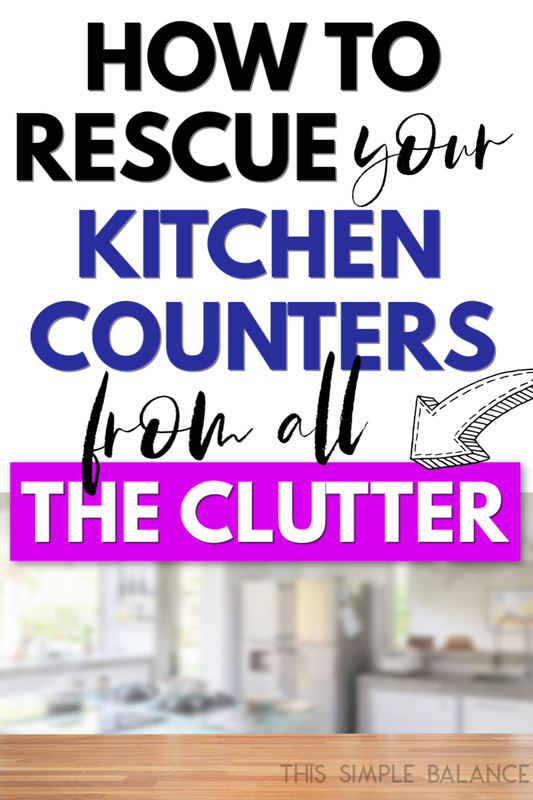 Can You Really Declutter Kitchen Countertops? 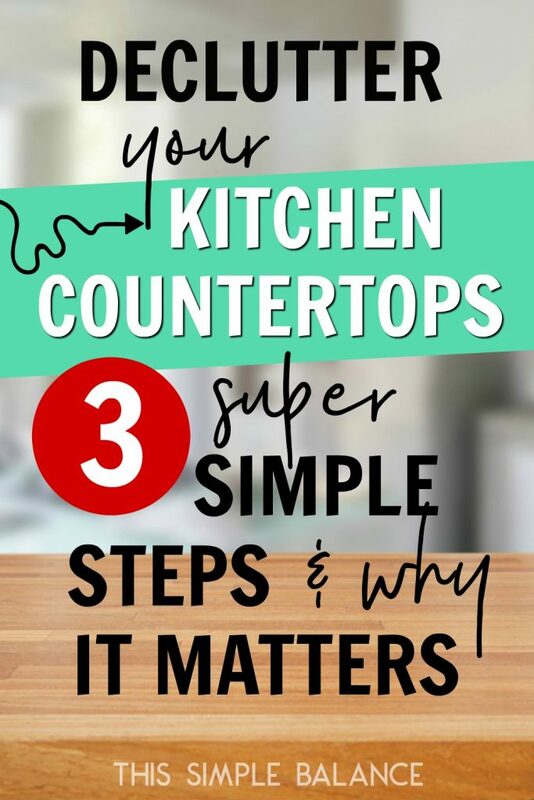 Every time I read about clear counters in minimalist books and blogs, I chalked up my cluttered kitchen countertops to my horrible kitchen and moved on. I really didn’t think it was possible or convenient. I had already decluttered enough. Clear kitchen countertops just weren’t going to happen. I also believed that the items I kept on the kitchen counters were items I used frequently enough that I was saving time by leaving them out. But after finishing The Joy of Less, the thought of clear kitchen counters just wouldn’t go away, so I took another glance through my cabinets. I tried to look with an open mind. Decluttering is never really finished. What else needed to go? Was I holding onto anything that I just didn’t use? My eyes fell on serving stands and platters. Those beautiful white dishes were wedding gifts, and they survived our many moves over the past ten years. The only problem? My husband and I hate hosting, at least the kind of hosting that requires pretty three-tiered serving dishes. We have four kids eight and under, and my husband is an extreme introvert. Even without those factors, I’ve never been very good at hosting – it stresses me out. So why do I need fancy serving dishes for parties I’m never going to host? Those dishes haven’t been used in over two years. My closest local friend loves to host. I finally gave them to someone who will use and appreciate them. Inspired by finding things that somehow survived my decluttering over the past few years, I looked through the cabinets again. My eyes landed on a coffee grinder. I’ve had a Keurig for a whole year and never use the grinder anymore. I tossed it in the “give away” box. Pyrex casserole dishes? We have far too many and never use the ones without Tupperware lids for easily storing leftovers. They could go, too. There were also several food items that were either expired or never going to be used. With all the clear cabinet space, I could finally move everything off the counters that I thought impossible to fit into the cabinets. Everything could finally be stored in the cabinets, on top of the refrigerator, or on our sideboard table, instead of on the kitchen countertops. And the results? You wouldn’t think removing a few things from your counters could change your life, but all those minimalist authors? They are absolutely right! 1) You will actually have room to cook. It’s truly amazing being able to cook with actual space for everything you need – cutting boards, mixing bowls, utensils. 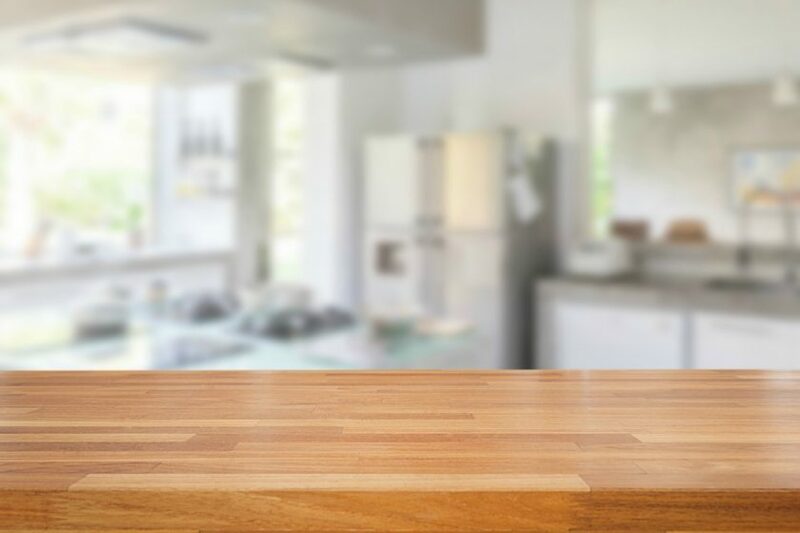 With clear counters, you don’t need to shift things out of the way to use the kitchen for it’s original purpose: preparing food! 2) Cleaning is so much easier (and therefore much more likely to get done). The battle to clean your house is half mental – maybe more than half. The thought of moving several items just to wipe down the counter? It’s enough to kill the little motivation I have left at the end of a long day. Removing pretty much everything from the counters also leaves no doubt about what is left: stuff that doesn’t belong there and needs to be put away. The fewer decisions you need to make when cleaning, the better off you are. 3) Clear kitchen counters reduce the negative effects of visual clutter. After the dishes are done and the kitchen is clean, clear counters are truly a gift to my eyes and to my soul. Side Note: Think you might be an HSP? Read this book to find out more. 4) You take better care of your appliances. Moving appliances from their stationary counter position makes you more aware of their condition. Just pick up your toaster and move it a foot. The crumbs on the counter and your feet will tell you the last time you cleaned it (gross!). I love our toaster, and it wasn’t cheap. Moving it up off the counter (as much as my convenience-loving, non-minimalist husband will let me) reminds me to clean it. I made so many excuses about why I couldn’t have clear kitchen counters. With a little thought and creativity, I rearranged until everything fit in a cabinet or a drawer (and without them being stuffed). 2) Be honest with yourself. Decluttering is very rarely a one-and-done event, especially with a big family. Stuff breeds like rabbits with little kids and needs to be decluttered regularly. When you live on a low income and are frugal by nature, getting rid of something that might be useful in the future is hard. You don’t want to get rid of something, only to realized a few weeks later that you actually needed it. And then there are the things you keep because you aren’t being honest with yourself. You keep bins of craft supplies, when you know that you aren’t a crafter anymore (that stuff was expensive! And I might do it one day). You keep shelves and shelves of books you know you’ll never read again because you just might. You hang onto the DIY tools and supplies, when you know DIY just isn’t your thing (at the end of the day, you either won’t do the project or you’ll end up hiring it out). Or like me, you think you hang onto things that represent the person you aspire to be (stellar hostess) but just isn’t you. Be honest with yourself, and give it to someone who will put those items to good use. You will free up your cabinet space to make room for everything cluttering your counters, and someone else will benefit from you letting go. 3) Establish systems for dealing with paper clutter. The kitchen seems to be the place where all the paper gets dropped (and forgotten about), and if you’re not careful, the piles will quickly get out of control. In order to avoid death by piles, you need decide in advance where every type of paper will live. Creating a family command center is an easy way to handle most of your paper clutter problems. You can see our family command center HERE. Another common paper problem for young families is kids’ artwork. I use this simple system that makes handling all those beautiful scribbles a breeze. 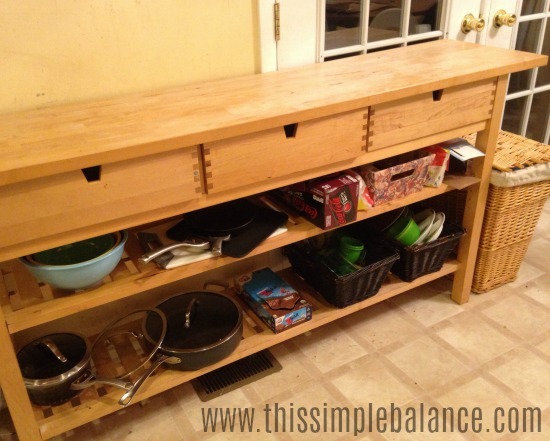 4) Think creatively about how to arrange and organize your space. Clear kitchen counters in a small kitchen is even more critical than in a huge kitchen. You need that counter space. Organization doesn’t have to be expensive, especially behind closed doors. I use old clementine boxes to corral my spices and make it easy to pull them down to find what I need. 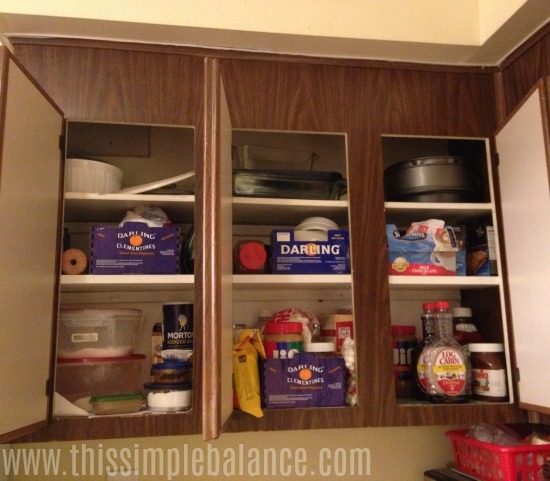 You can make room in your cabinets, and organize them in a way that makes sense to you and your family (that’s the real trick, isn’t it?). If that’s a struggle for you, Pinterest has a million ideas, as does this book and this one. Keep items close to the kitchen countertop on which you regularly use them. Sometimes, this just isn’t possible. Move things too far from the appropriate counter, however, and convenience will be a real problem (especially for family members who care about those extra ten seconds it takes to get the appliance out). 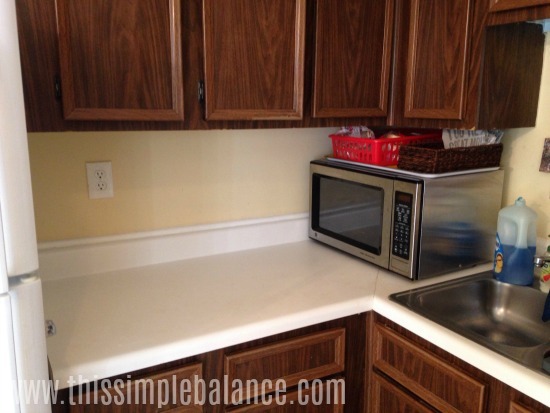 Still skeptical that clear kitchen countertops can make that much of a difference? Try it for a week or two! Let me know how it goes in the comments. Thanks for this post! What a great idea! Decluttered the kitchen last night and woke up and looked at the kitchen and felt awesome whereas normally I get overwhelmed seeing the mess. Even things I thought I needed out, I put away. We’ll see how it works as I bake and cook the next two weeks especially with the holidays!! I’ll keep you posted!